Where it happens to be is on North Main Street just north of Steeple Street, the pedestrians ahead that it is talking about are trying to cross at Park Row at the corner of the Roger Williams Memorial, while traffic barrels up North Main Street like a bat out of hell. I can’t recall if a crosswalk was actually painted here to accompany the signs, but really, the way traffic moves here, and the weird geometry of the intersection (how Meeting Street and Park Row are offset but traffic tends to move through as if they are not, even moving the wrong way on North Main at times to get from Park Row to Meeting), there needs to be more thought here than signs and paint. Bump outs are needed on the sidewalks so that pedestrians can see oncoming traffic, and oncoming traffic can see pedestrians trying to cross. I find, as much as we talk about how terrible Rhode Island drivers are, if someone sees me, they have a tendency to stop if they can. 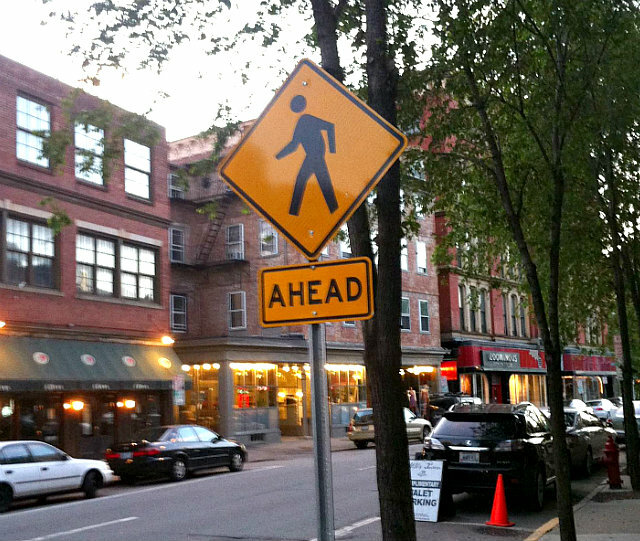 But really, this sign should not read “Ahead” rather it should read “Everywhere.” Within the city, there should not be any areas where drivers are given special notice that there might be pedestrians, it should be an assumption that drivers in the city make about everyplace. We’ve built this section of North Main in such a way that we make drivers forget there are pedestrians and we’re forced to put up signs then to remind them. What do you think of the idea of eliminating all such street signage as a way of making drivers more aware of their surroundings instead of relying on the shorthand of signs like these to figure things out? I’ve heard it can actually reduce traffic accidents. I appreciate this post too. In general, one-way streets with 2 lanes of traffic facilitate fast auto traffic that can make pedestrian crossings more dangerous and disagreeable which is one reson why I generally thought conversion to 2-way (such as on Empire) is a good idea. I tend to think its not just infrastructure, but enforcement of safe driving rules (for example, not running red lights, no texting while driving…) that could help the pedestrian culture here too. I like Barry’s idea. Why is North Main 2 lanes? Why not make it a 2 way street? Not only will that facilitate slowing down traffic, it will make it easier to get around the city by car (not something we necessarily want, but people who have to drive around the block get annoyed and drive fast). Plus the 2 lane road right after people get off the highway just makes people want to continue driving fast. Making it a 1 lane road will ease that. The other thing he mentioned… enforcement of traffic laws. I realize our cops are busy. But seriously… I can’t tell you how many times I see people run red lights, stop signs, and just don’t stop at crosswalks (even when the pedestrian is halfway into the driving lane, they just drive around the pedestrian). We need some better “don’t block the box” signage for drivers. I think it was in Philly where that’s big and I think they have a big painted “X” in the intersection. North/South Main is horrible for that problem.